Look smart, act smart, think smart! 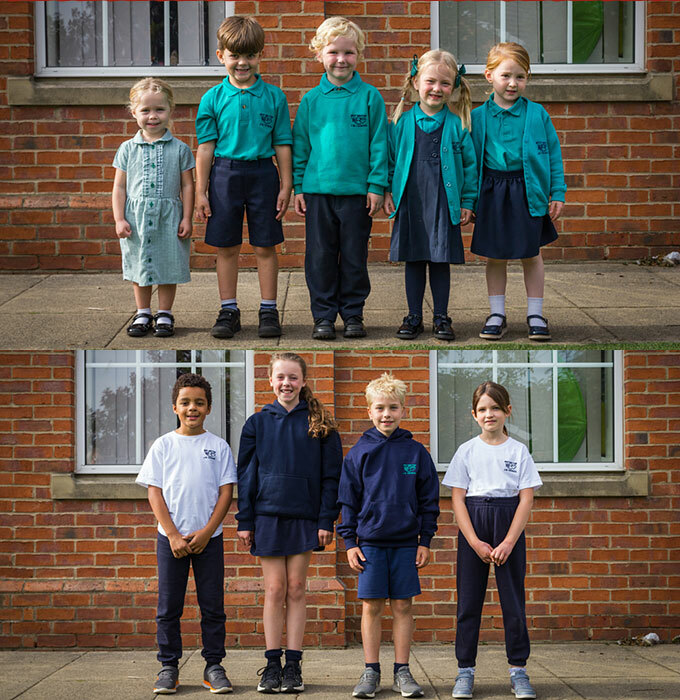 All of our children wear uniform to develop a sense of pride in being a member of our school community. Our school uniform is green and navy blue. All children wear the school’s green t-shirts and green sweatshirts or cardigans with the school logo on. Boys wear navy trousers and girls can wear either a navy skirt, trousers or pinafore. We recommend that smart trousers be worn as opposed to jogging or tracksuit bottoms. In summer the girls have the option of wearing the uniform listed above or wearing a check or striped dress in the school’s colours of green and white. Sensible dark footwear with flat heels should be worn; preferably no trainers. In Foundation Stage it is useful to have a pair of wellingtons which can be kept at school. For PE, children wear navy shorts, a white t-shirt and black pumps. Navy tracksuit bottoms, a navy sweatshirt or hoody and trainers are recommended for outdoor PE for children in Year 1 upwards. Please make sure that your child’s name is in every piece of clothing. This helps us enormously if your child loses anything! We have strict rules on jewellery and only permit small studded earrings and watches. Earrings must not be worn in PE and therefore children will be expected to remove them for this activity. If a child is unable to do this then earrings should not be worn on PE days. Children should have their ears pierced at the start of the summer holiday in order that they can remove them for PE in September. Long hair should be tied back for PE sessions.